Okay-here they are, a sneak peak at the newest addition to the FairyTale Collection! These are almost finished. These are all on longer chains, probably 22"or 24" long- since long is in... 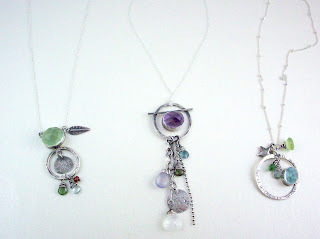 I am only showing 3 of the 5 since the other 2 pendants aren't polished or set. I am so in love with this collection!! These will be numbers 5-10 (series 2) in this particular collection. They are all one of a kind and pieces 1-4 (in the first series) have sold. There is only one left and it's the Beautiful Mermaids. The common thread in all of the pieces is the dreamy wording and the beautiful, cushion cut gemstone cabs. I just love the process of clustering these brilliant cabs with beautiful gemstones and coming up with wording to match with the feel of the colors. I am just waiting to see which one needs to be mine because I don't have a FairyTale yet!